In part one I covered my talent build, pet choice & pet spec, glyphs, enchants and gear itemization. In part two, my goal is to provide you with a few tips and pointers on getting the most out of your new build and play style. There is obviously no specific rotation for PvP, as encounters are ever changing and unpredictable, not to mention we’re almost never afforded the luxury to sit back and settle into a raid rotation. Depending upon what buffs my target has up, I’ll often switch to Tranquilizing Shot at this point to start knocking off buffs. Unfortunately, it doesn’t always remove the buff you want it to, and sometimes it can be resisted. I’d suggest applying Serpent Sting if no other cooldowns are up, or if your target is a Rogue. Steady Shot is seldom used, but if you’re in a BG or arena and are unmolested, feel free to blow Rapid Fire and break off a few steadies if your other higher priority shots are on cooldown. If you’re new to the class or the Survival spec, just pull Arcane Shot off of your action bar as soon as you spec SV, then stick Explosive Shot in its place. Lock and Load is an important part of Survival’s burst capability, so understanding how to effectively use it is critical. Because BGs are often chaotic and sometimes lacking in coordinated team efforts, I often use frost traps to try and keep melee targets under control, as well as enabling my melee teammates to lock down casters. Apart from the obvious benefit of CC’ing your target(s), another reason to heavily utilize your freezy traps is for Lock and Load procs. Although Snake Trap can be pretty quickly neutralized through even the weakest AoE, they can be pretty handy at times. Power Auras can literally do just about anything, but here’s a quick look at what I use it for. This looks like a bit of a mess, but the reason is I have all of my Power Auras activated for demonstration purposes. The yellow puss-cat just below the leaf is a warning telling me that my pet is taking damage and his health is below 60%. The gold symbols on the inside left and right of the Serpent Sting aura notify me when Lock and Load procs. Those six little red candy corn looking thingies flash when my health goes below 50%, letting me know I’m in a bit of trouble. The blue circular aura around my toon shows when I am in Aspect of the Viper, and the bright star-like aura dead-center tells me that I am not in Dragonhawk. Lastly, the red jolly roger at the bottom signals that my target is below 20% and ready to die. Basically, if I’m on top of my game, I should only have a few auras visible at one time. 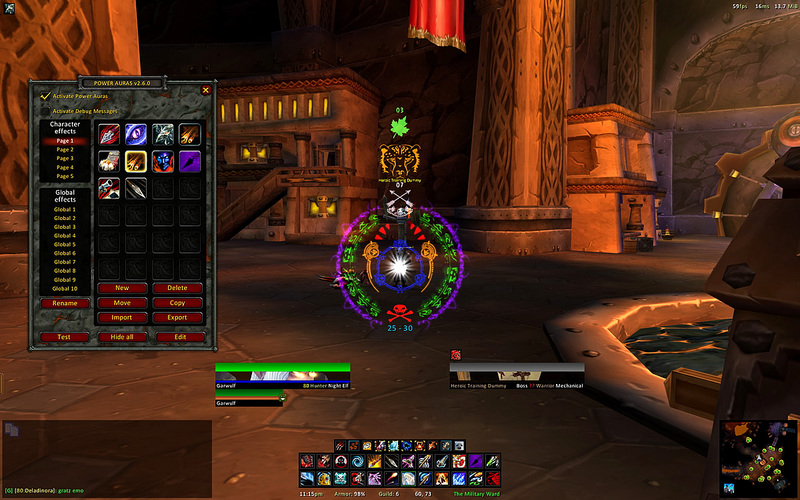 As I said, Power Auras is one of the top addons worth having, especially as a Survival Hunter. Rather than list all of the useful Hunter macros I can think of, instead I’ll just refer you to my macros page. These are pretty simple macros which allow you to CC another target without deselecting your current target. Well hopefully some of the things I’ve covered in this two part series helps a few of you out there. Is this post over 3500 words and probably adequate for giving the newbie a jump-start in Survival PvP? If anyone has any other tips or suggestions, please send ’em my way in the form of comments. I have issues with the hunters mark aura, it will show up no matter if mark is up on target or not (read: i cant make it go away with marking the target). Tried sifting through options but couldn’t find anything that I thought would cause this. OT: Awesome site, really really good info for me as I just dinged 80 on my hunter and plan to mainly do BGs and Arena on him. I’ll most likely just post a few screenshots, along with a detailed list of addons used and why. Sorry to bother you so much with this but I just started an arena team with some friends and have been doing some BGs for honor and I am in need of a good UI. While it is true that all three specs give impressive DPS, one truly stands out from the triumvirate for PvE raids and dungeons, and that is Survival. When it comes to your shot rotation or priorities, you need to know first how many targets are you dealing with. When dealing with multiple enemies, your rotation is almost the same except with some additions and conditions depending on the size. When it comes to 4 or more, if you're adventurous and want to relive the days of WOTLK, then by all means spam Multi-Shot. I dropped one point into Go for the Throat for a little added DPS, but that’s a matter of preference. I only throw one point into Entrapment because ice traps can be resisted quite often, therefore negating this talent. Survival Tactics provides a nice reduction to trap resistances, but I like it most for its 4 second reduction to the Disengage cooldown. When it comes to PvP, I’m not usually a huge fan of talents that have only a 10% proc rate, but Master Tactician is too good for me to pass up. Depending upon your play style and whether or not you like to arena, pet choices can be fairly subjective. The reason I recommend these two pets is because they both possess valuable snare abilities. However, spiders have some pretty cool abilities for PvP as well… First off, their snare can be cast from range, allowing the pet to lock down a target without getting into harmful melee range. As a Survival Hunter, the one stat you’re going to want to stack above all others is agility. Since Survival gains 30% attack power from stamina, piling on health is not a bad idea either. Intellect is always a good idea for the 1 to 1 attack power conversion from Careful Aim, in addition to the deeper mana pool. Crit rating is a decent stat, but I’d put it behind attack power and definitely behind agility in order of importance. Last but not least, if you plan on doing some arena, then there is one other stat you need to seriously consider. Druids are ever present in arena, and since SV thrives off of fire damage, it is important to be able to neutralize the Druid’s GotW. All in all though, it sounds like you’re doing quite well and have done some homework. I would like to thank you i am working with your spec you have here and it has made a heck of alot of difference to my game. I roll BGs with a carrion bird, The constant AP debuff with damage is something I couldnt resist. I’m thinking one point from Improved Tracking and one point from Hunting Party would be the places to borrow from to fill out Entrapment. Careful Aim is just an amazing talent, especially since it’s such a value at only the 2nd tier. Scorpids could still be useful in drain type situations, so as to bury your Viper Sting under their poison, but I feel as if there are too many other better choices. Garwulf let me ask you something, dont you thing that was better take 3 points of noxius sting and apply 3 points in improved sting so you can get a higher dps from serpent sting. 75 Spell pen is enough to negate GotW and helps in the off chance a Pally decides to throw up a fire resist aura. I’ve played around with the flares quite a bit, but i have yet to actually see one help me out. I mainly try to keep a flare up at all times and a trap at my feet if I know a rogue is lurking about. There is not enough of a difference in terms of damage between pets to make a significant difference in PvP, which is why it becomes more of an issue of special ability. In all the fairness, pet damage can be anything from 10% to 13% of your total DPS when MM specced. Please join us on our 128 slot high quality TeamSpeak server so you can chat with other players! Survival remains one of the most popular hunter talent builds for grouping, raiding, and pvp. First of all the goal with this survival talent spec is to optimize our raid dps, and to put us on the top of the damage meters – where every hunter deserves to be! I preach about how amazingly good the dps of this talent is a lot — and yet I’m telling you to only take one rank. One of the defining talents of the Survival Build, because of the way it works with explosive shot. This is an easy talent to overlook, because we really don’t care about Wyvern Sting in raid situations. Another defining talent of the survival hunter build, and the one that will make the rest of the raid love you as you benevolently hand out the mana regen. The purpose of this two part post is to offer up some basic tips and suggestions for those new to Survival Huntering, a quick-start-guide if you will. The purpose of that post was to offer a brief overview of the spec and to help better optimize your toon for success in BGs or arena. There are however a few basic things to note when it comes to knowing which shots to use and when. Maintaining uptime of the 50% healing debuff is extremely important when trying to take your target down, especially in arena. You may wonder why we need to glyph it considering the effect and cooldown are both 10 seconds. Explosive Shot is Survival’s highest damage shot, plus it has an incredibly high crit rate when properly talented and glyphed. Black Arrow not only adds a nice DoT and damage debuff to your target, but it also starts the proc timer running on Lock and Load. Since PvP is all about burst, Serpent Sting isn’t terribly important, especially since it can be cleansed pretty easily by many classes. Arcane Shot is not used by Survival hunters at all because it shares a cooldown with Explosive Shot. Just as in PvE, the trick to handling Lock and Load procs is to allow enough time in between Explosive Shots so that you get the full damage from the initial blast, plus the two subsequent ticks. I use Freezing Traps mainly for self-defense purposes if I see a melee target coming after me. They are especially useful vs casters who are susceptible to interrupts, along with the chance that the snakes might apply Mind Numbing poison. This addon is one of my absolute favorites, and one I highly recommend for all Hunters, not just Survival Hunters. The pulsing green leaf and timer show me how many ticks are left on the heal so that I don’t overwrite it. I don’t use Mirror for PvP, but if you have a PvP trinket such as Anvil of Titans for example, Power Auras can be used to notify you of the proc and time remaining. The strings listed here were for an earlier version of Power Auras, so they may or may not work as intended. There are many other beneficial uses for Power Auras, so I suggest playing around with it some to find what works best for you. You can set all sorts of filters for it so that your screen isn’t so spammy, plus you can configure triggers that will notify you of certain hostile spellcasts or enemy heals. This addon, or similar ones such as Quartz, are helpful in allowing you to customize how you want enemy cast bars, buff and debuff timers to display. For those unfamiliar, Gladius is a unit frame addon for showing specifically your opponents in arena. With the amount of split decision making that goes on in PvP, anytime you can combine multiple spells or commands into one keybind, the better off you’ll be. There are however a couple of Survival specific macros that I’ve yet to include on that page. As I said, I didn’t write these posts to teach players the art of owning in PvP as a Hunter. I didn’t foresee part two being this labor intensive, so when I got to the end and thought about linking all of the info to WoWHead, I said f**k it. I was hoping to find a hotshot Gladiator to share some wisdom, but you may have to settle for me. More than likely what it will be is a conversation starter where I give my advice and tactics, then others chime in with their experiences. And with the help of Mastery, Explosive Shots and Black Arrows often give damage as much or even more than a critical KillShot. However, once BM was laid to rest last week, I decided to jump ship and become an explosives expert. I could see where some Hunters may want to dip into Endurance Training for a little added insurance, but one hallmark of the Survival tree is added health and survivability. Mortal Shots and Lethal Shots are necessary for PvP burst, but most importantly, they get you down the tree to Aimed Shot. We can be locked down pretty easily, so the further we can be pew-pewing away from our target(s), the better. However, I feel there are two pets that set themselves apart from all others as top choices. Both can lock down a target for 4 seconds, which is highly advantageous for battlegrounds, and invaluable for arena. Crabs are sturdier mainly due to Blood of the Rhino, and possess some great PvP abilities such as Charge and Intervene. There are a few racials and talents that can increase misses above 5%, but I’d recommend against stacking hit in place of another stat once you reach 5%. I haven’t read through all of the comments posted here but I want to know if anyone else has played with the Talent: Savage Strikes much at low level PvP? It is not because I want the 4 second entrapment from frost trap, but because even with diminishing returns I will have a 2 second entrapment from snake trap. Although they’re one of the classes that really get under my skin as Survival, I still prefer a pet that works pretty good vs. That combined with my resilience is usually enough for me to get the upper hand, unless of course I don’t have any CDs available. All pets will do a certain percentage of your total damage, but the difference from pet to pet in a PvP scenario is going to be negligible. In my post I indicated that a live tanky-specced Tenacity pet will likely produce more damage than a dead Ferocity pet. What they’re mainly used for is utility, interrupts and a little added dps come kill time. While not hugely different from the crab, I like the thought of keybinding web and just using my spider when it’s time for the kill. While high end raid gear lets MM pull off better dps, hunters still get the big numbers out of the SV hunter talents. In the Survival tree we get plenty of crit, agility, and health along the way, making the suvival talent build very fun to play in addition to the best hunter damage build. However, don’t miss that it’s giving you an extra 3% damage to all shots while your Serpent Sting is up. However, remember that as a survival hunter, you will crit a lot, and you can only have one of these effects up at a time. However, if you have the two-piece set bonus from the Tier 9 set (from TotC or purchasable with Emblems of Triumph) suddenly your Serpent Sting is doing enormously more damage. Aimed Shot does about the same as multi-shot, so on a tank & spank style fight it’s not really netting you any extra dps. In this part of the guide, I’ll give you an overview of the basic PvP shot selection, Survival Hunter mechanics, as well as show you some useful addons and macros. If you get lucky with RNG, these two opening shots can take your target down to nearly 50% within seconds. Depending upon your target and what buffs are on them, Tranq Shot may need to be used right away. Unless you’re a MM Hunter, Serpent Sting uptime need not be too high on the priority list. This is a given for any experienced Hunters, but this guide isn’t necessarily intended for them. The beauty of Lock and Load is that your focus fire target need not be the snared target in order to trigger the proc. If you fire off your second and third explosives immediately, you will actually do less damage to your target than if you had fired off an alternative shot in between cooldowns, or just simply waited. This is more easily said than done, but one thing I try to do is utilize an ice trap of some sort every single time the cooldown is up. If I see a healer or caster DPS all alone and in mid-cast, then I’ll go for a Freezing Arrow. It’s highly customizable and can display all sorts of things including, health, mana, enemy cast bars, and even pvp trinket cooldowns. Hunters have quite a bit to worry about due to the abundance of abilities at our disposal, in addition to a pet to control and look after. I could then update the guide with the additional tactics; creating a comprehensive post on how to deal with other classes. Also, thanks again for taking time out to create such an awesome source of information about our class. This means that you can just macro trang shot into your other shots so that every time you use a shot other than auto, it also shoots a tranq shot. I know that setting up a whole UI post its time consuming, so I wanted to ask if it would be possible to post your UI on a site like WoW Interface. Since there may be other displaced BM PvPers like myself, I figured I’d provide a glimpse at my spec, as well as share some of what little knowledge I possess concerning Survival Huntering in the realm of player versus player combat. I usually do pretty well in both BGs and arena, but I am always out looking for ways to step my game up. I’m sitting well over 26K health unbuffed, so I saw better use for these points elsewhere. For those players new to PvP, know that you absolutely must have Aimed Shot if you plan entering battlegrounds or arena. Trap Mastery is great for added CC, as well as increased damage from traps and Black Arrow. They also have a nice ability called Bullheaded, which acts like sort of a pet PvP trinket along with added damage reduction. Heart of the Phoenix is somewhat of an answer to the problem, but you have to sacrifice DPS in order to get it. If you arena, then I wouldn’t recommend going with anything below 700, since Hunters are nearly always the first focus fire target in any match. Attack power is good for Survival, but always itemize agility over attack power whenever possible. Survival’s bread and butter is attack power based fire damage which is not affected by armor penetration. Though I have not played with it past level 30 I get crits like crazy with Savage Strikes maxed from level 17 and kept it till now at 27 with my Raptor Strike and Mongoose Bite. The extra time on the snare can seem like an eternity in PvP, plus as you said, it sort of helps account for DR. I don’t really see any other configuration for the points in the MM tree, apart from maybe taking 1 point from GftT. Im just thinking that arcane shot is one of the mosted used shots by the hunter and the extra 15% bonus plus rapid killing 10% bonus gives good amount of damge. Their abilities are going to come in handy no matter who you’re playing against, where as a scorpid really only shines vs teams where you need to drain a healer. In fact, aoe skills can be a problem if the target is near a cc’d target that the bear might likely break. This guide will show how to spec your SV hunter talents tree for optimal damage in a raid or group environment. Note that the difference between 0 and 1 talent point here is huge — so leave one point if you can. It turns out from our testing that Survival hunters have so much crit that 2 ranks of this talent is just wasted overkill. The 2 second shorter CD helps to deal with those variables and allow for more uptime on the healing debuff. Firing a Freezing Arrow on top of a healer mid-cast is an excellent way to provide you with more burst damage while nuking down a DPS target, plus it’ll prevent that healer from topping off your target. If you’re lucky, your target may trinket the Scatter Shot only to find themselves in deep freeze immediately there after. Unless you know your Freeze trap target will be left alone, Frost Trap is almost always a better option, especially if you’re specced into Entrapment. As a Survival Hunter, I find the addon very useful for displaying a modular debuff timer for Explosive Shot. I have a separate SBF bar for my poison, so I still knew when to reapply, but I had thought the power aura was acting up or something. I’ve seen people post their WTF and Interface folders along with a premade profile on each add-on so that one can recreate their UI. Even if Survival Instincts only provided a 4% crit bonus to Explosive Shot it would be a must have, but it also gives you 4% damage reduction. When combined with Survival Instincts and Glyph of Explosive Shot, this talent puts me well over a 50% crit rate for my Explosive Shot. Depending on how they’re specced, they can also dish out a little added damage over that of a Tenacity pet. Also, Ferocity doesn’t have Roar of Sacrifice, which is pretty necessary for PvP in my opinion. This can be obtained by a 35 spell pen cloak enchant and 2 20 spell pen gems, or by slotting 3 epic spell penetration gems. Thing is, that’s a pretty important point not only for DPS, but also to make sure your pet has enough focus for its special ability. Thing is, you have to get the killing blow in order to receive the buff, which can be a real crap shoot in PvP. In particular, you should take Focused Aim to reach the Hit Cap, and if you’re rocking the T9 2-piece set bonus, you probably want to go with Improved Stings. Take the points away from Imp Aspect of the Hawk or Sniper Training, which has sporadic downtime in raids anyway. This is huge for movement intensive fights — having another instant shot to fire off on the move can be very valuable for maintaining your damage. If anyone has any advice or constructive criticism pertaining to this post, macro suggestions, tactics, and especially arena strategies, then please share. Overall, Cunning and Tenacity just offer a better arsenal of talents as far as level 80 PvP is concerned. The reason for this is to burn through the 76 resistance provided by the Druid’s Gift of the Wild. I also think this is a beauty Talent for me when I am out of mana and I am forced into melee situations and or overwhelmed or both. The extra 1% agility for additional talent points isn’t worth it – there are better places to spend those extra points. I try to keep half my gear with STA attributes and the other half with AGI and I think I have a ring that adds a few points to Crit Rating (I have nothing special). Maybe I can improve this lowbie PvP build or be persuaded to not go into Savage Strikes at all in Low Level PvP. Thanks Gar for this awesome site and you probably already know your PvP button at top of page is broke at the moment o.O If not, I hope you see this soon. 02.04.2014 at 20:47:51 Slightly than the extra widespread?Red Wiggler. 02.04.2014 at 21:51:38 Like a good idea the scale of the tank relying on what your friends informed you.